The pulmonary veins are the veins that transfer oxygenated blood from the lungs to the heart – it is a main function of the veins. The biggest pulmonary veins are the 4 primary pulmonary veins, two from each lung that drain into the left atrium of the heart. The pulmonary veins are part of the pulmonary blood circulation. The most essential function of the pulmonary veins is to bring oxygenated blood from the lungs to the heart, which is then pumped outward to the rest of the body. After the blood is reached other parts of the body through arteries, it loses oxygen and develops into deoxygenated blood. The body can not live and grow without oxygen; hence the pulmonary veins are of terrific significance in this field. They hold the secret to appropriate functioning of the circulatory and cardiovascular system. 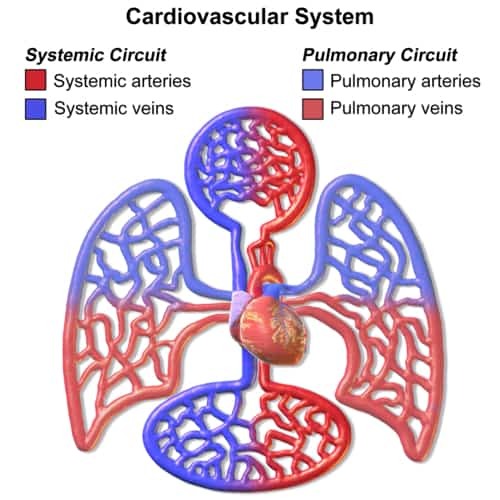 As part of the pulmonary blood circulation they carry oxygenated blood back to the heart, rather than the veins of the systemic blood circulation which bring deoxygenated blood. An uncommon genetic defect of the pulmonary veins can cause them to drain into the pulmonary blood circulation in entire or in part, this is referred to as a total anomalous pulmonary venous connection, or partial anomalous pulmonary connection, respectively. Two primary pulmonary veins emerge from each lung hilum, getting blood from three or four bronchial veins each and draining into the left atrium. An inferior and superior mother lode drains each lung, so there are four mother lodes in total. At the root of the lung, the right remarkable pulmonary vein depends on front of and a little below the pulmonary artery; the inferior is positioned at the lowest part of the lung hilum. Behind the pulmonary artery is the bronchus. The right main pulmonary veins (includes oxygenated blood) pass behind the right atrium and superior vena cava; the left in front of the coming down thoracic aorta. Sometimes the 3 lobar veins on the right side remain separate, and not rarely the two left lobar veins end by a typical opening into the left atrium. Therefore, the variety of pulmonary veins opening into the left atrium can differ between 3 and five in the healthy population. The two left lobar veins might be unified as a single pulmonary vein in about 25% of people; the two right veins may be united in about 3%.